Dates: Dates are a rich source of calcium and contribute to strong teeth and bones in children. In Ayurveda, dates pacify the Pitta dosha and promote positive emotions. Dates soaked in water for 5-6 hours can be a good Ayurvedic snacks option accompanied with milk after playtime. Coconut-jaggery balls: If your child craves something sweet, you can make this easy and delicious sweet for him/her. Grate a coconut finely. Boil some jaggery till it becomes a thick syrup. Once it cools, create small balls by rolling the grated coconut in the syrup. A simple and healthy option from Ayurvedic snacks that can be stored for upto a week. Sprouted sandwiches: Sprouts are considered as fresh and natural ‘living foods’. While plain sprouts may not be as popular with your kids, try boiling sprouts with fresh tomatoes and onions and putting them as a filling for grilled sandwiches. Vegetable soups & smoothies: Raw and fresh vegetables like carrot, beetroot, cabbage etc. are excellent sources of vitamins and minerals. You can infuse them into healthy home-made soups and smoothies to get your child interested in eating them. Eating them regularly will strengthen your child’s immunity and reduce their craving for junk food. Fresh fruits with yoghurt: According to Ayurveda, ripe fruits eaten at the right time and right season are like nectar for the body. Fresh fruit enhances ojas energies which aid digestion. Mango, watermelon, grapes, bananas, apples, amla, pomegranate and pears are fruits that help balance the The best time to eat fruits is a little while before meals or separately as a snack. Fresh corn: Corn on the cob, or bhutta, is a tasty after-school snack that is infused with complex vitamins and fibre content. Roast a cob of corn and rub it with lemon for a tangy, tasty snack for your child. Or you could also boil sweet corn and add a pinch of red chilli powder and lemon to it as a nourishing bite that is full of the goodness of nature. Finally, for better digestion you could also give your child our Thaleesapatradi Choornam. It promotes better digestion. Healthy habits begin at a young age at home. 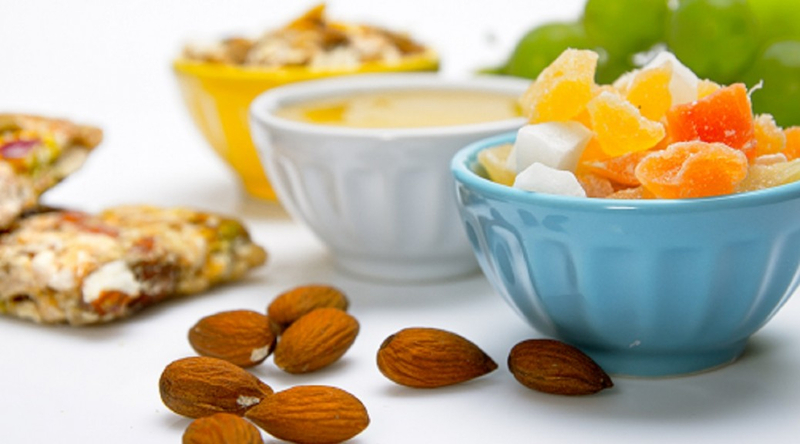 The above are just some of the many wholesome Ayurvedic snacks you can give your kids. Limit candy and other junk food as a special treat once in a while. Use interesting shapes and ways to present these snacks to make them more fun and appealing. Your kids are likely to continue these great eating habits well into teenage and adulthood.